Like many of you, anytime I read a new book or watch a new webinar, as long as I learn one new thing it’s time well spent. 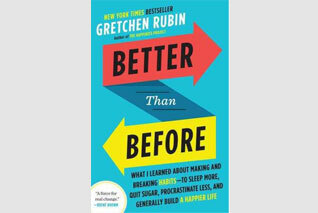 This new book I’ve just finished reading is called Better than Before by Gretchen Rubin. It’s all about Habits. Good habits, bad habits, how they are formed, how to break (actually not break but outgrow) them and really learning how to ‘control’ them. What I found most interesting is that the motivation to start a habit, continue a habit, or break a habit is really very individual. What works for one person will NOT work for another. The author has categorized type of people into four groups or Tendencies. Upholder, Questioner, Obliger and Rebel. An Upholder meets outer expectation and inner expectations, A Questioner resists outer expectations and meets inner expectations, an Obliger Meets outer expectations and resists inner expectations, and a Rebel resists both outer and inner expectations. The idea is that if you want to start a new habit and make it stick or end a bad habit, the process would be different for each type of person. For example, an Obliger would need an external pressure, such as a walking group to make sure you go walking every week. The Obliger might not go on their own, but if the group is expecting them, then they go. Or the Questioner might need a reason to go walking, maybe for good health or for a break during the day and doesn’t need a group to motivate them, the idea of increased health might be enough. Several other concepts in the book were also good. Talking about how to keep a habit. She referenced four Pillars of Habits – how to keep a habit really. Monitoring, Foundation, Scheduling and Accountability were all concepts used to ‘keep’ the habit. Each one though depends on the type of person you are and what motivates you. For example, the Accountability idea would be great for the Obliger who likes to meet outside expectations, but for a Rebel, Accountability would have the opposite effect. They would rebel against an outside influence determining their actions. 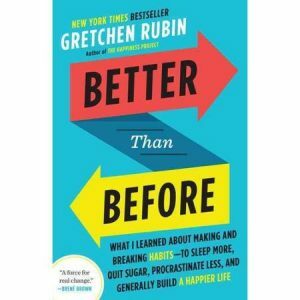 Most interesting I thought, was the idea that forming habits (which this book focused more on creating good new habits vs eliminating bad habits) required automation – not making decisions. That really resonated with me. The idea that once you put a habit in place, it needs to be automatic, so that you don’t have to ‘think’ about it, no decisions. THEN the habit has a much more likely hood to stick. For example, I have a friend who was doing yoga several times a week from an online bank of videos. Each day she would have to choose which video to watch. Then a flu illness and she stopped doing it, thinking she would pick it up after she felt better. But several weeks later, I asked how yoga was going. She replied not so well, I haven’t been able to start up the videos again. After reading this book, I realize it was because she had to make a Decision each time on which video to watch. The decision required made the habit not stick. I suggested joining a group that automatically provided the class, or find another video site that provided a set video for each workout, no decisions necessary. The idea is if you have to think about it, then it’s not a habit that will stick. It must be automatic for any hope of lasting. The idea of automating habits can be applied to all aspects of your life, personal or professional. The goal is to Be Better than Before, to establish habits that forward your own goals in a way that works for you. Certainly a thought provoking read with some very practical advice tailored to an individual’s needs on how to be better than before by implementing goal oriented habits that are to be automatic and have a chance at lasting change.